There are also many life events where a beautiful engraved river rock will make right commemorative statement. Natural engraved river stones are a great alternative to flat granite slabs. Memorial stones for friends and family members made from river stones are great pieces of commemoration that look great in any yard or garden. 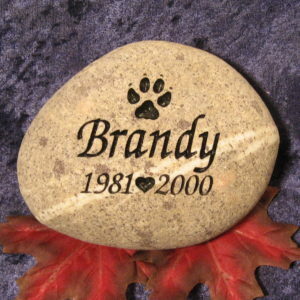 Our beautiful pet memorial stones are always well received as well. Our memorial stones will serve as reminders of the love and times that we have shared. A deeply and precisely carved stone will make a statement that will indeed last many lifetimes.